The Guatemalan Squeezy Honey Drought that befell the Mustard Seed on Pancake Day last week will be etched into the annals of Mustard Seed history. Instead, Shoppers were having to resort to the deliciously fruity Paraguayan strawberry jam & absolutely ambrosial chocolate hazelnut spread containing hazelnuts from Malawi, cocoa from Equador and sugar from Costa Rica to put on their pancakes. I mean - who wants to put a whole fairtrade world map on their pancakes eh? We also ran out of the Orange/Cinnamon Rose/Geranium soap sets from Khayelitsha township in South Africa - but I'm not sure that had anything to do with Pancake Day. If it did - then I wish you a speedy recovery. The good news is that we're much better prepared for World Pi Day that's coming up this Monday in the 3rd month of the year and the 14th day of that month (3.14) . We do NOT intend to run out of pie. OK - trivial point - we don't actually sell pie. But let's not get picky. The aroma of pie often wafts in from next door. We can be sure however that Henry Pye (poetlaureately) would turn in his tomb (gravely) if we ran out of Pie (metaphorically) on Pi Day (homophonically). Yes - we're talking Star Wars and May the MetaPhors Be with You here. We're talking Motherhood & Apple Pie. We're talking about All that's Wholesome & Good. What the Mustard Seed has in abundance. In English and in Latin. Pie Jesu . So: here's a few simple guidelines for Pi Day: Fill your pie hole with humble pie. It's easy as pie, not pie in the sky. Better than telling pork pies, or getting pie-eyed. Please note: the wholesome goodness of Mustard Seed Motherhood & Apple Pie is only available on those days in the month when the date is divisible by itself. P.S. 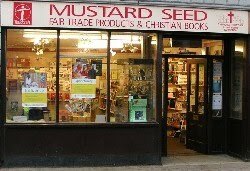 For those craving a bit of real maths: if you multiply the diameter of a mustard seed by 3.14 then you still get a very small number. P.P.S. And if you want to hear what Pi sounds like then click HERE .